Low-E glass is a common term you’ll hear if you’re shopping around with new windows and it’s important you understand the main components of quality windows before making the decision to buy replacement windows for your home. 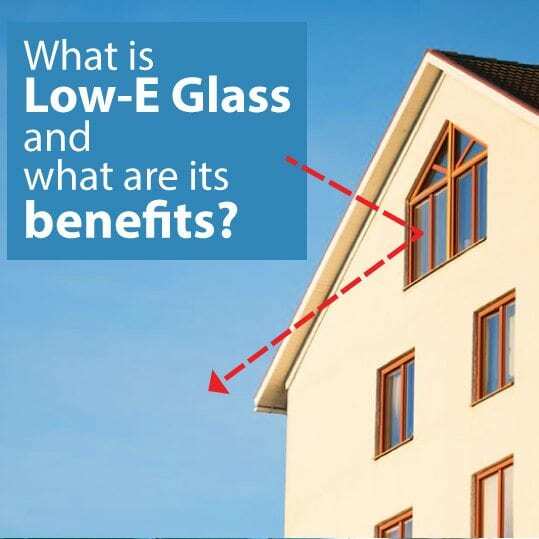 If you’re wondering what Low-E glass means, it’s really quite simple. Firstly, it stands for low emissivity glass. It’s a technologically advanced glass with superior insulating qualities. It provides noticeably improved energy-efficiency by significantly reducing the transfer of hot or cold air through windows. In other words, have you ever seen fading on living room furniture that is positioned directly under the sun? That is likely indication that the windows in that room probably are not equipped with Low-E glass. Having replacement windows installed with Low-E glass has many advantages. The Low-E coating actually works to reflect heat back to its source, whether it’s on the outside or inside of the window. This helps to keep you home cooler in the summer and warmer during the winter months. The coating won’t wear or scratch off because it is applied to the interior side of the glass which also protects against harmful UV rays and fading of any nearby furniture. Low-E glass can actually block out up to 95% of damaging UV rays, not only is that beneficial for the health of your family living in the home but also for comfortability. You can brighten up your living space by allowing the sun to shine through without overheating the room entirely. During the winter months, the insulating qualities of your windows will directly impact the temperature and air quality in your rooms. Low-E glass can be your home’s solution for controlling the warmth in your home and humidity levels. The technology embedded in Low-E glass windows is quite impressive to say the least. You may find that Low-E glass mostly come standard now, but if you’re moving into and planning on remodelling an older home the chances are the windows are not up to this standard. At this point, you should definitely consider brand new window replacements with Low-E glass which can offer you significant long-term savings. The coating is not visible to the naked eye which is one of the qualities that allows as much natural light in through the windows as possible. It’s also this transparent coating that works to protect your home from unwanted UV rays which can be damaging to your skin, fade your carpets, and furniture. Plus, it also helps to control radiant heat as it enters and leaves a room. By now, Low-E glass is probably sounding like the obvious choice, but the question for most homeowners is are investing in Low-E glass replacement windows really worth it? Well as experts in residential window installations we can offer our best recommendation. Despite what anyone may say, we believe that natural light is a home’s best asset. The more natural light you can bring into the home, the more spacious and inviting your living space will be. Sun is a natural source of energy and when you have sun working for you full=time, you have the ability to cut down on energy costs during the day. For families, this is a mighty bonus. Problem is, when you open up your home to exterior elements, there is risk involved such as over exposure to damaging UV rays, heat loss, or too much heat gain. Low-E glass provides the perfect balance between these allowing more natural light and controlling UV rays. It is the solution for letting in natural light without all the issues that come along with it. With that being said, it is always a good idea to invest in Low-E glass windows, they are 100% worth the investment. Not only will it help in controlling energy costs but it will create a more comfortable living environment for everyone in the home.